In my household, the wife routinely forgets where she left her keys, and my son misplaces his iPad mini or Nintendo 3DS XL on a near-daily basis. Thanks to Find My iPhone, we always know where my family’s Apple products are, but that leaves plenty of other household items to potentially elude us. While it may be impractical to attach smart tags to everything you own, we all have a few crucial items like house keys or a wallet that could benefit from such technology. Up to seven Pixie Points can be paired to a single iPhone, making it easy to track multiple objects around the home. On the surface, Pixie isn’t much different than other smart tracking devices I’ve reviewed in the past, such as Chipolo Plus or TrackR Bravo. One key difference is that Pixie requires at least two teardrop-shaped smart tags called Pixie Points—one attached to your iPhone or iPad, another on the object you want to keep tabs on. Points use proprietary signaling to remain in constant communication with each other, triangulating your location for increased accuracy instead of relying on the smartphone alone. Finding a misplaced item is a three-step process: First, you perform a panoramic scan of your surroundings, scouring the area for Pixie Points located within a 30 to 50 feet indoor area, or up to 150 feet outside. For best results, you’ll want to stand as still as possible as you turn 360 degrees while holding up the iOS device. When the desired item has been found, augmented reality “pixie dust” appears on-screen, at which point the hunt is on. Thankfully you can skip this first step, which tends to be time-consuming and a bit repetitive after the first few times since Pixie can’t remember previously scanned rooms. As you move in the direction of the item, the app switches to pointer mode, a real-time compass that steers you the correct way. Once you’re within five feet, the app changes to “metal detector” mode, which provides audible beeps that become more energetic as you hone in on the lost item. Measuring 1.9 inches tall and 1.4 inches wide, Pixie Points are roughly the same dimensions as competing trackers, but thinner at only 0.1 inch, still thick enough to be visible when attached to most objects. Available in orange, yellow, blue, and green, each Point provides up to 12 months of typical use. That’s twice as much as competitors, but the battery is non-replaceable, meaning you’ll eventually have to discard and replace it. One thing I like about Pixie is how the package thoughtfully includes everything you might need. All Points ship with adhesive backing—just peel and stick—and the sealed case is water resistant, able to withstand being submerged in shallow water for up to 30 minutes. Pixie is sold in packs of two ($50) or four ($100), each of which come with a variety of handy accessories including key chain ring (great for attaching to pet collars); a sticker for curved surfaces like eyeglass cases; cleaning wipes; and extra adhesive backing. Purchasing a pair of four-pack kits allow users to “Pixify” up to seven items in total, currently the maximum number of Points that can be paired due to Bluetooth limitations. After performing a panoramic scan of the area, Pixie uses augmented reality to display “pixie dust” over the area where your tagged object can be found. Attention to detail aside, using Pixie in daily life is a mixed bag. Losing or misplacing important items such as a wallet or keys tends to make people rightfully anxious, so Pixie’s whimsical and somewhat drawn-out approach to finding them may not appeal to some users. 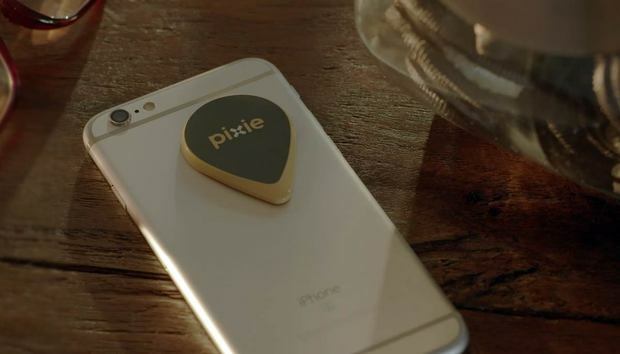 Pixie currently bundles a specially designed iPhone 6 or 7 case (including Plus-sized models) that features a molded space on the back capable of cradling a Point without sticking it directly to the device. The case texture tends to be too slippery to maintain a firm grip, and I’m not a big fan of having a Point attached to my smartphone all the time. If you’re similarly disinclined, Pixie won’t be a good fit. Otherwise, if you take a deep breath and let the technology do its thing, Pixie can be fun and quite useful. Pixie makes finding lost items a little like playing Pokémon Go, but the length of time it takes to track them down in the first place will prove frustrating for many smartphone owners. 'Workaholism': Is More Than 50 Hours' Work a Week Damaging Your Health?